Beatrice Lane Suzuki (1878-1939) was an extremely well informed and sensitive expositor of Mahāyāna Buddhism. As the American wife of the influential Zen Buddhist Suzuki Daisetsu, she lived in Japan for many years, becoming very familiar with the leading temples of various Buddhist schools—especially in Kyōto and Kamakura. 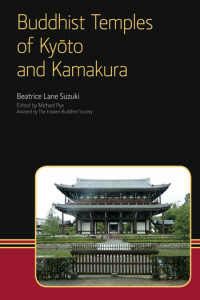 Buddhist Temples of Kyōto and Kamakura brings together some of her writings from The Eastern Buddhist. The collection preserves valuable information from Suzuki’s own times and the charm of her personal discovery of the temples described here. Further information is also provided to place them in their current context. The volume will be of interest to scholars of Japanese Buddhism and to the many travelers to these sites today. In this book it is a pleasure to learn about famous temples like Kiyomizudera, Ginkakuji, Engakuji, Mount Koya and others. But it’s useful in the classroom as well. Her essays remain invaluable for giving students a first-hand view of the architectural, religious, and literary riches tied to these famous Buddhist temples.